This year, it is more important than ever to be a part of this important fundraising event. I have spoken to many doctors and scientists over the past year and they all say that the cutting edge research that is taking place right now is, day by day, uncovering the mysteries and unlocking the key to vision for those afflicted with hereditary blindness like our precious daughter, Katie Starr. The Foundation Fighting Blindness is leading the way by funding these important clinical trials that are our hope for her and so many others. There are so many important causes that deserve your money. I personally donate to many of them myself. I ask you to look into your heart and remember those like my daughter who will face a life in the dark without your help. I know in my heart that our girl will be just fine no matter what happens to her vision....that is just who she is. Marc and I, like all other loving parents just don't want life to be that much more difficult for her with that additional barrier in her way. We will do everything in our power to keep the lights on for her, so I am asking you directly and I also ask you to ask your friends to please choose to give to this worthwhile cause and if you can....walk in solidarity with us on November 12th in Fort Lauderdale, Florida. Being the parents of virtual twins has been nothing short of amazing...so amazing in fact that I have been wondering why all children do not come into the world two by two! 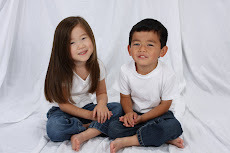 Katie Starr and Ethan have been best friends from the moment that Katie fed Ethan her cheerios at the Civil Affairs Office in Nanchang, Jiangxi on Ethan's adoption day in 2007. They share pretty much everything and quite willingly I might add. I am not sure if they have some amazing mojo together or if it is just our amazing parenting (smirk) . It really doesn't matter though because the end result is the same! Now to the chink in the armor; the proverbial other shoe that always drops. Today, Marc and I got a glimpse as to our future and it is a bit unnerving! They are Co-Conspirators and they keep secrets!!!! I guess our rose colored bi-focals somehow chose not to see that! Katie: "Ethan, I am going to tell you a secret but you can't tell Anybody!!!" Ethan: Always the willing accomplice, "OK, what is is Katie?" Katie: "Julian in my classroom asked me to marry him!" Ethan: "He wants to kiss you?!?!?" "YOU ARE NOT ALLOWED TO DO THAT!!" Katie: "He doesn't want to kiss me...HE WANTS TO MARRY ME!!!" There is no kissing in marriage?!? Marc popped his head around the corner and and was going to ask what they were talking about. Katie started to launch into one of her cheers from her cheerleading team to cover up her secret....OH MY! Then Marc asked her and she spilled her guts and told him. Of course, he told her that she is waaay to young to get married and to now even think about it again until she is 30...LOL. These two always have their heads together, whether they are playing or helping around the house and most especially when they share quiet time together. I can see that the two of us are going to need to stay pretty sharp to keep up with the two of them. One thing is for sure....it will be very interesting in our home for the next 12 years or so.....stay tuned!